During the first fifteen days of the promotion, the price of motorbike rotation will be free. After, and for a limited time, the price of the motorbike rotation will be 0.40 €/hour (discount of 50%). Creation of a new subscription Daily 9.30 Moto, without deposit and with a free month with a minimum stay of two months, and with a discount of 50% in the rotation of motorbike at BSM Parking Network (depending on availability of each car park). 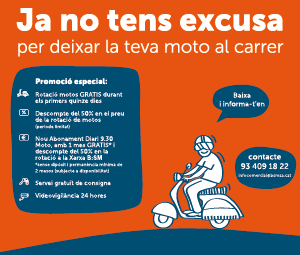 In BSM Gràcia Motos Car park, special promotion of 24-hrs MOTOS season ticket for 25 € VAT including, valid for new contracts and limited to the first 12 month of the contract. In addition, no initial deposit, one free month with a mínimum stay of 12 months and 50% discount on the motorcycle rotation in B:SM Parking Network.